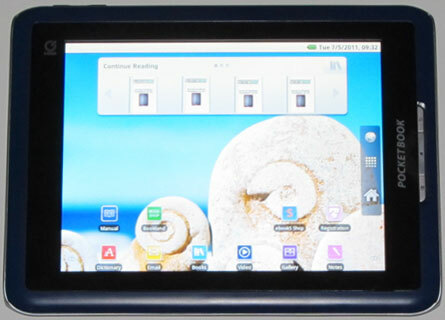 PocketBook has released a firmware update, version 2.1.1, for the PocketBook IQ Android ereader. The update is available for download from the PocketBook IQ support page. Make sure to backup your apps and ebooks first and to read the upgrade manual because it says that you must have firmware version 2.0.6 installed before attempting the update, among other things. Basically all you have to do is download the update, transfer it to an SD card as is, then stick it into a turned-off PocketBook IQ. Then hold the volume+ button and power button together until the device turns on. That’s it. The update will boot automatically and the IQ will restart. Visually a lot has changed with this update. The homescreen and app icons are totally different, along with the continue reading widget. It looks much better, and the homescreen is now a proper Android homescreen, not PocketBook’s version. They’ve also added support for Adobe DRM. Unfortunately the IQ is still running Eclair, not Android 2.2, so there’s still no Flash support. 3. Increased power consumption after synchronization in sleep mode (so called ‘Night awakening’). Has anyone managed to root this version to install Android Market and have applications on the SD card? Hello. How to update this e-reader?